A version of this article was first published by The Globalist on November 27, 2018. U.S. Treasury investigation spotlights Russians, Syrians and Iranians. By Frank Vogl, November 30, 2018. The diagram and photographs in this article are from the United States Treasury. ﻿More than two decades ago, from 1995 to 2003, the United Nations ran an oil-for-food program for Iraq. The country was then under the iron fist of Saddam Hussein. What we were to learn from an international commission of inquiry in 2007 was that international sanctions are an invitation to all manner of corruption, including money laundering. What was true back then is just as true today. However, it appears that the U.S. Treasury has learned from the past. For that reason, it has taken the extraordinary step of publicly detailing a brand new scheme of abuse – by naming names. The Iraq-related UN racket was exposed by a commission headed by former U.S. Central Bank chief Paul Volcker. Now, U.S. Treasury Secretary Steven Mnuchin has taken a leaf out of the Volcker book and exposed a scheme that could serve as the plot for a major movie. The central character is a Syrian national Mohammad Amer Alchwiki. He runs a company called Global Vision Group in Moscow. The U.S. Treasury in an extraordinary press release published photographs of Alchwiki – usually Treasury statements are full of technical jargon, but this one has a dramatic diagram and colorful photographs. 1. Russia wants to be seen as supportive of the regime of Bashir al-Assad in Syria. 2. Iran wants to both sell its oil which is under U.S. sanctions, and aid the Syrian government. 4. Alchwiki and his associates clearly want to enjoy handsome commissions. At the core of the scheme, stated the U.S. Treasury, are the Iranians who are breaking U.S. sanctions by shipping oil and helping the Syrians to pay for it. The Global Vision Group has been arranging the shipment of millions of barrels of oil from the National Iranian Oil Company to the Syrian government using vessels insured by European companies. Then, the Assad government uses the Global Vision Group to assist in moving hundreds of millions of dollars, which originated with the Central Bank of Iran, to the Islamic Revolutionary Guard Corps-Qods Force (IRGC-QF), which serves as paymaster to Hamas and Hizballah. Illustrative of how money laundering schemes operate, the participants in this racket used intermediary companies to hide their operations. Dealings with the Iranians by Alchwiki’s group were managed through a Russian company Promsyrioimport, which is controlled by the Russian Ministry of Energy, and an Iranian pharmaceutical company, with funds coming from the Central Bank of Iran. The U.S. Treasury has targeted nine individuals and organizations for sanctions in this scheme, but will this action make any difference? It may well end up forcing the Iranians and Russians to establish new operations to achieve their purposes. But it seems unlikely that the U.S. action will diminish the determination of the Iranian and Russian governments to support the Syrian regime and to use Iranian oil in the process. Sanctions, as we have seen often, and as seen so clearly in this case, push the sanctioned groups and governments into operating schemes through intermediary companies to cover the illicit flows of goods and cash. Bribery becomes a standard part of the process. Cash transfers across borders are hidden as far as is possible, and often successfully. Sanctions, I believe, could be more effective if a far tougher anti-money laundering set of measures were in place by the governments that control all important Western financial centers. 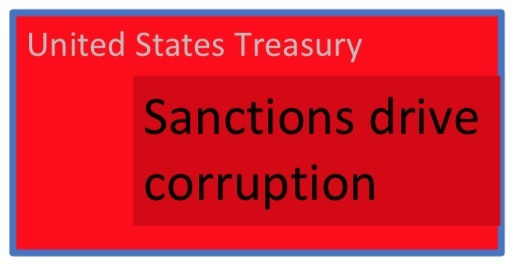 It is ironic that the U.S. Treasury should be so vigilant and effective in investigating and exposing sanction-busting schemes, and so understaffed and ineffective in exposing illicit financial flows into the United States. The United States does not have in place a system that requires the naming of the beneficial owners of shell companies that are controlled by foreign citizens and own investment assets in the United States. The U.K. has this, and it ought to be a model for all countries. Republican and Democrat leaders in both houses of the U.S. Congress have been giving increasing support to draft legislation that could to a degree resemble the approach that the British have taken. The legislation will be taken up by Congress next year. The newly exposed Russian-Iranian-Syrian scheme, exposed by the Treasury, may help to convince the politicians that this is fundamentally a national security issue – and anti-money laundering enforcement is crucial if U.S. sanctions are to be effective.